The CRM maintains close ties with the different professional societies in the mathematical sciences: CMS, CAIMS, SSC, and CAP. The president of the CMS is an ex-officio member of the CRM Scientific Advisory Committee. 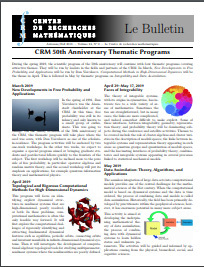 CRM also financially supports a number of initiatives of the CMS, such as the mathematical camps, the Canadian Mathematics Education Forum, as well as the travel grant program for students who attended the joint Canada-France meeting in Toulouse in 2004, and co-organized the second Canada-France meeting in Montreal in 2008. Together with the other institutes, the CRM organizes or sponsors special sessions at the CMS, CAIMS, and SSC meetings. The CRM awards a prize each year jointly with the SSC; similarly, with CAP, it awards a prize each year in mathematical and theoretical physics. Moreover, the CRM hosted the 2004 Annual Meeting of the SSC, and the large Workshop on Computational Biology in the Post-genomic Era at CRM in 2005 co-organized with all mathematical institutes in Canada, the NRC (National Research Council Canda), and several enterprises. In the summer of 2008, the CRM co-sponsors with the other Canadian institutes, the public lecture by Stu Kauffman during the Montreal meeting organized by SIAM on Life Sciences.